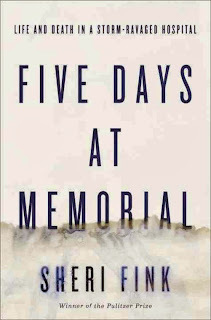 This book is a devastating account of what happened at a hospital in New Orleans after Hurricane Katrina hit in 2005. Sheri Fink spent years reporting on this story and her writing is strong, filled with grim details and dreadful scenes, but it needed to be told. After the storm, Memorial Medical Center was flooded and lost power, stranding a large staff and nearly 200 patients, many of whom needed oxygen and ventilators to help them breathe. Due to communication breakdowns, a lack of emergency preparedness, and massive failures from both the hospital's owner and the government, rescue operations were slow and stalled, leading doctors and nurses to prioritize patients into groups of who would be rescued first, or at all. "Nobody wrote it directly in a message, but some employees began to worry that the choice of which patients went out first could affect their medical outcomes. A realization dawned on Memorial's incident commander, Susan Mulderick, that day. The variability in the sizes of helicopters that were landing and the length of time it was taking to move patients to the helipad left her with one conclusion: not all of the patients would be getting out alive." "In the days since the storm, New Orleans had become an irrational and uncivil environment. It seemed to [Dr.] Thiele the laws of man and the normal standards of medicine no longer applied. He had no time to provide what he considered appropriate end-of-life care. He accepted the premise that the patients could not be moved and the staff had to go. He could not justify hanging a morphine drip and praying it didn't run out after everyone left and before the patient died, following an interval of acute suffering. He could rationalize what he was about to do as merely as abbreviating a normal process of comfort care — cutting corners — but he knew that it was technically a crime." The first half of the book provides almost an hour-by-hour account of what happened leading up to the storm and in the days following its landfall. It is a gripping, emotional read, and the situation is unimaginable. As conditions worsened inside the hospital — it was stifling hot without air conditioning, the only light came from flashlights and there was a overpowering smell of urine and feces because the sewers were overflowing — the staff described it as a hellish war zone and as a place that was no longer America. The second half of the book, called The Reckoning, focuses on the investigation into the patient deaths. One doctor and two nurses were eventually arrested, but charges were later dropped due to a lack of evidence, overwhelming public and political support for the workers, and criticism of the lack of preparedness and support from the government: "The issue of larger responsibility and blame, regardless of whether it would be admissible in a court of law, was on many people's minds. Individual decisions at the hospital had occurred in a context of failures of every sort. Since the storm, government agencies, private organizations and journalists had churned out reports that analyzed and found fault with actions and inaction at nearly every level of every system." 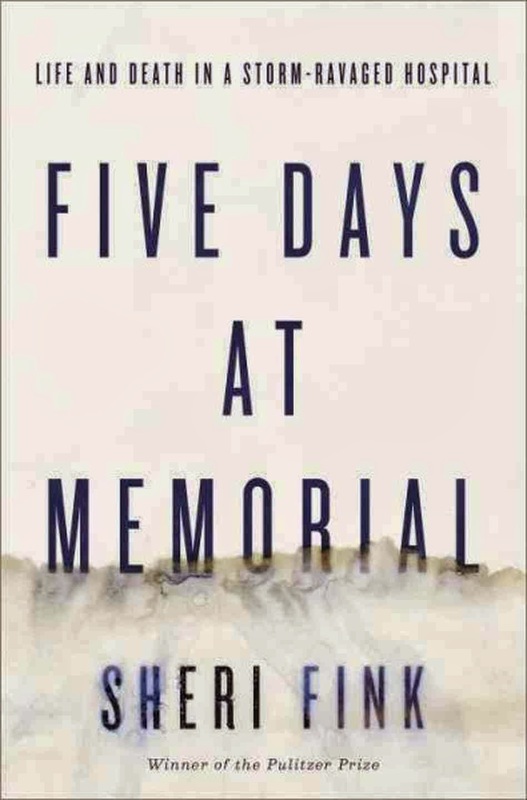 Fink's epilogue highlights the lessons learned, if any, from what the hospitals in New Orleans faced after Katrina. Fink compares the situation to what happened after the earthquake in Haiti and Hurricane Sandy hit New York City. In both cases, health care workers had to make tough choices about who would get access to limited medical resources. Fink's reporting is alarming because it addresses the issue of how many hospitals and other medical facilities have their generators on the ground floor, which can become useless in event of flooding. Similarly, not enough has been done to plan for emergency situations, such as a massive flu outbreak or another natural disaster. "Life and death in the immediate aftermath of a crisis most often depends on the preparedness, performance and decision making of the individuals on the scene. It is hard for any of us to know how we would act under such terrible pressure." I would highly recommend the book to health care professionals, first responders, those interested in bioethics, and anyone who appreciates excellent reporting.